After reading this, what's your rating? 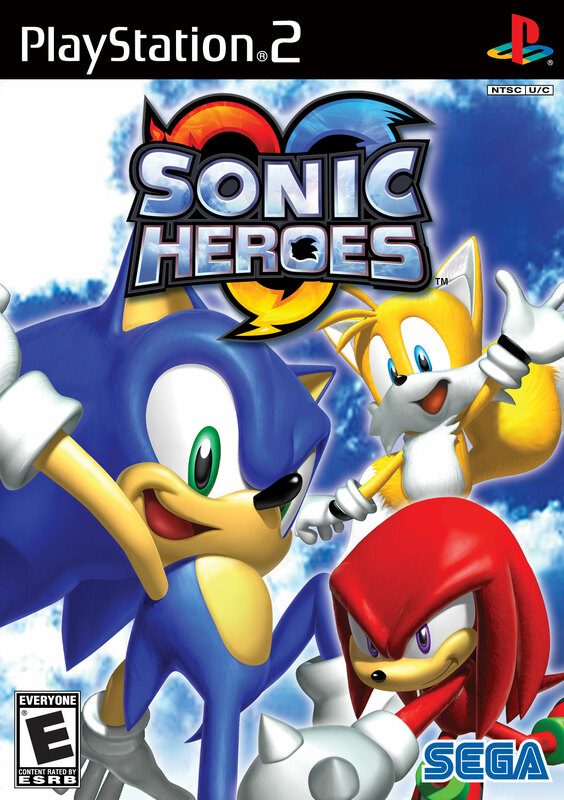 The franchise's debut game to the PS2...SONIC HEROES is the first PS2 adventure for this speedy hedgehog. With multiple storylines and great graphics, this is a game you don't wanna be without. This game has LOTS of stuff to keep you busy. Whether your unlocking 2-player challenges through story mode or trying to complete an one in-game challenge after another, this game will be the only game on your agenda for at least the next week or so, maybe longer. 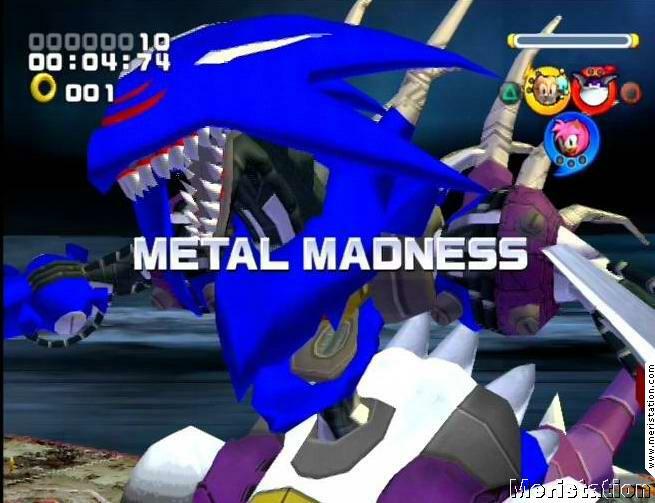 Epic boss battles and puzzles to solve only add to the fun. Team Sonic - Highly Skilled players should be able to take this quest on. Team Dark - This team's quest is a little bit harder, but not too different from Team Sonic's quest. Team Rose - For players wanting to learn the game, this is the easiest quest. 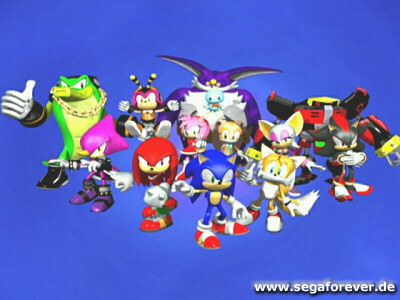 Team Chaotix - Like Detective work? This quest is both Easy and Hard. The gameplay varies per team. Every team has a character with a skill that is used for certain parts of the game. Every character has different attack move and every team has different Team Blasts, which are super powered Team attacks. Every story is different, so some things you've seen before in one level with one team may change if you use a different team. It is also possible to get the character's skills upgraded so they have stronger moves. You earn a rank at the end of every stage based on the amount of points you get. How many points you need to get the best rank varies by team, and the score is based on how many rings you have when you finish, how fast you finished the level, how many power-ups your character has, how often you used them, etc. On boss stages you have to finish within a certain amount of time to get the best rank, so beat the boss as fast as you can! There are "keys" 2 stages of every area. 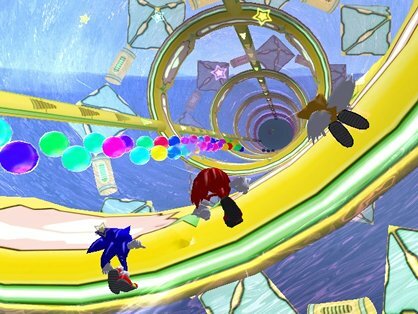 The 1st stage "key" gives you a trip to a bonus chalenge ot make some extra lives, while the 2nd stage "key" gets you a chance to chase and catch a Chaos Emerald. The emeralds are important to the completion of the game and if you don't catch them before they reach the end of the bonus level you lose it and have to get the "key" and finish the 2nd stage all over again to get another shot at grabbing the emerald. This game's only flaws other then a song mess up and the camera messes up now and again. And the game can sometimes glitch, but other than that, great game. Controls are easy to use and respond perfectly. Plenty of secrets can be found, emeralds to be collected, story's to beat, enemies and bosses to PWN, plenty of mini missions and challenges to overcome, etc. There is plenty to love about this game. I give it a 9 rating. This review is tribute to NintendoFreak, who (and I quote) "dumbly sold my copy...". NF, I hope you get another copy. RetroBowser wrote: there's no text wtf? I wish you had it so we could compare High scores, best times, etc.